The only losses this child was trained to fixate on were fat and inches. In that category, loss seemed elusive, distant and always required more discipline and endurance than I had. By now, at almost seventy, I have lost the weight, the way, my youth and several fortunes. But, my first and most serious loss was announced in a rather benign telegram. I had no image for this event until my sainted mother reported -after her visit to the mortuary – that my father had been “decapitated. ” She said this so flat out and plainly that I had to ask what the word meant. Her explanation included how she could see the stitches peeking over his tie. So this image branded the horrible event. In the Chicago hotel, she smoked and breathed whiskey for comfort as I sat there obsessing on the dreadful vision she had provided – so gratuitously. I did not have the mind to wonder about the permanence of death as I was waiting for the “seriously slurring” part of the evening. Finally, my sister signaled we could cross the street to Granny’s. It was Granny, who really needed the whiskey but it was not her way. She paced her bedroom mumbling about how none of this would have happened if he had not taken up with the shicksah. She circled a subtile Nain. Grandfather’s eyes followed her from the Baroque Gold frame and she continued her bitter monologue. This was my first view of despair. somehow, I could see but not feel her depth of emotion. I was frankly numb except for a vague dread of what would happen when she saw my mother. Most certainly, they would not embrace graveside. There was red anger and black misgivings on both sides of Astor street. That night seemed impermanent and cold as the wind gusting through the open transoms to vent the radiators. The starched sheets rustled all ice and brittle and my sister whimpered on the bathroom floor as she had all during the kidnappings and long divorce. It seemed more home than any place had in a long while. Breakfast with the maids in the kitchen was hyper normal. They were from Norway, so, were always solemn and orderly. We chewed our old person flavored bran in the usual silence. They told us that the family would receive guests all day and the funeral would follow on the next morning. There were no plans for anything beyond these mysterious rituals. And, we were expected to be present for all of this while my mother was excluded. This was the endless familiar tension. It was most pleasant without her around. I could slather butter my popovers and eat all the Frangipanni mints I wanted. And not be pestered by her cosmetic concerns. So what if I would need to wear a dresses like tents or came down with diabetes? Back at Granny’s I was free.. Grief or no this was stern comfort I did not know that I missed it until this dark reunion. I wondered if I could just stay. You know, not go back to L.A.? During the reception, my sister sat listlessly on the other brocaded chair in front of the fire place. I maintained my focus on a hoard of canapés, when, Uncle Sam glided to my side. I was the youngest and female so, it was not like any of the very grey men to engage me beyond a greeting. But, somehow, Uncle Sam stood next to me, said “condolences” and fervently pressed a twenty dollar bill into my hand. “Huh?” I thought and thanked him. Having given me this gift, he slithered away into the Minion. My mind went wild: Did my sister also get a surprising handshake? Would I have to share it? What was that about? Yes I’m back with Oxlajuj B’atz’! The news was all over Santander: Mayan Families has opened a SPA where we can get our “paws and claws” done. I dropped by to see the brightly colored shop and to meet the Maestra, a fashionable gal from Texas. Susan Mabry had her own shop in a swanky neighborhood in Dallas and is delighted to work with Mayan Families imparting cosmetology to her students. They have learned to apply nail wraps – silk and acrylic and how to give neck and arm massages. You can get a simple manicure/pedicure for 200Q or you can get the Deluxe treatments –Sugar scrubs and hot wax facials. The first time I came, there were some regular Mayan Families volunteers from Faith United Methodist in Westchester, Ohio. They had probably broken a few nails hauling down 27 suitcases full of clothes and school supplies. And, they were even more excited about getting their ultra-grungy , O’Neil stove installing nails repaired. I asked one of them what color her nails were being painted. “’I am not a Waitress’” she said. In response to my confused look, Celine Woods, Esq. explained that she was a human rights attorney but the polish had been named that. This group of volunteers traveled down with their children — to give them the opportunity to serve. In one case a mother who had adopted her, now, teen-aged child from Guatemala was taking him to meet his birth family. “He and his sister have been talking on the internet for the last few weeks and I expect the meeting to be very smooth,” she said. The shop was quite abuzz with the younger girls darting in and out. One of Sharon’s daughters was in to give the ladies a little practice and, incidentally, to change from Pink to Orange. “The ladies graduate after they complete 50 Pedicures and an equal number of Manicures. During this time they are using our tools and they are welcome to buy them—somewhere else. We don’t sell the tools because then we lose them,” Susan explained. She even plans to outfit them with traveling beauty boxes so they can be on-call for the hotels. Way to go, Mayan Families; thanks for always serving the Mayan community and, this time for making Panajachel even more beautiful. 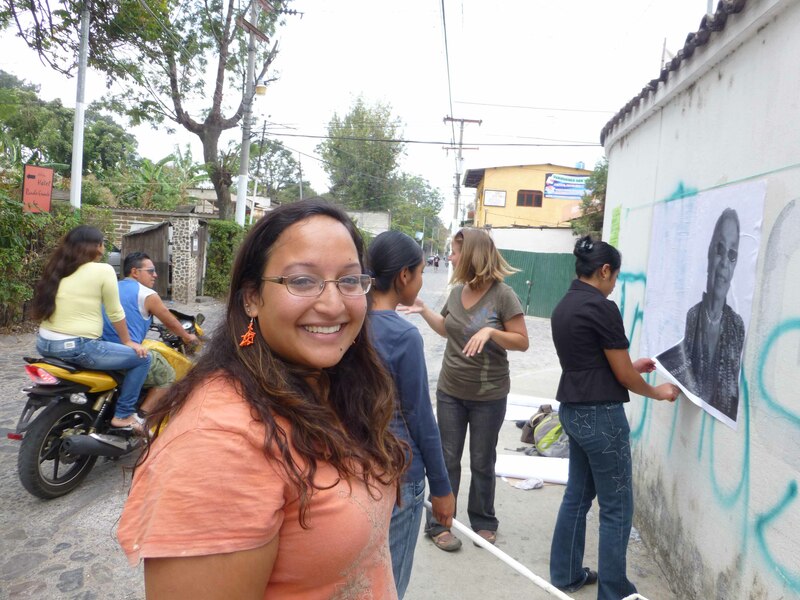 Ayoung Kim blogged about her experience in Guatemala in Santa Cruz del Quiche. Pilot for Kickstarter — just testing the waters…. 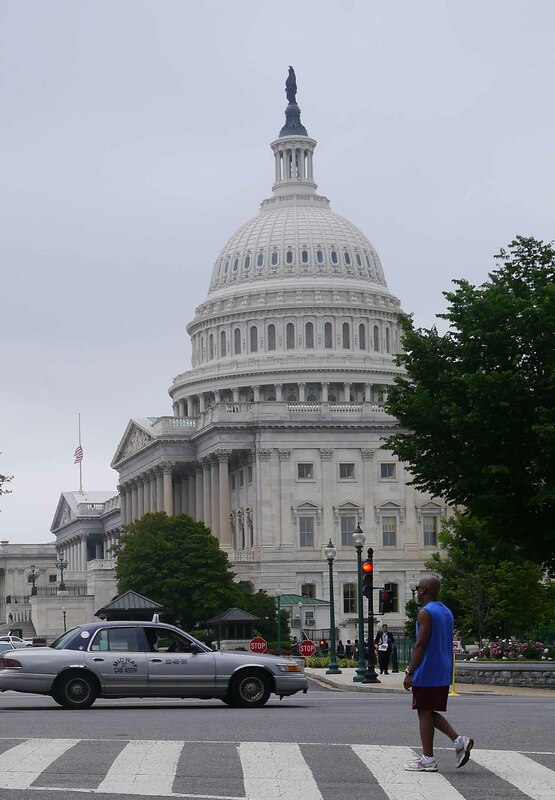 The flags on the capital were at half-staff for Monday’s Oklahoma tornado victims as I began circling the Old Senate Office Building looking for where to go in. Three quarters around I came upon a queue of dyspeptic government types. But, directly in front of me there was a young man, who had a flyer that let me know he was also bound for the USAID Press Conference. “What is your mission to the Water Policy meeting?” I inquired nodding to the paper in his hand. “Oh,” he said brightly “I am from BIG-Name-Brand-NGO and happened to be in the Capital this week; so, I thought I would go. “Are there such things?” he asked. “Not exactly… My Wall Street ‘Source’ told me that the Nature Conservancy of New York and Rudolf Steiner Foundation had recently funded land buys and school construction. And, she allowed that, in this economy, public private/partnerships are a necessary trend in municipal funding. And, she thought that an entity like USAID or the Canadian CIDA might guarantee the Bonds instead of forcing the NGO to put their own Balance Sheet on the line. She cautioned me that a big hump for NGO’s is the cost of filing because underwriting a Bond Issue and selling in all states it is an expensive proposition. He asked me which NGO’s I was tracking in Guatemala and then he told me, cryptically, that USAID was only giving out “IQC’s.” As we made our way to the coffered, gold leafed, chamber he explained that small NGOS would probably have to band together and form consortium in order to even be considered for an Indefinite Quantity Contract. These contracts are only awarded to giant NGO’s because they are able to deliver the minimum and can live with a capped contract since it promises them the follow along work if there is any. USAID’s initiative was driven by the Senator Paul Simon 2005 Water for the Poor Act that made water management part of Foreign Policy. Undersecretary of State, Robert Hormats told us that “State Failure” can follow from short sighted water policy. This is a real “security issue;” particularly in a time of crisis like drought or flooding. Mr. Hormats said that for every $1 spent for sanitation $9.00 worth of value accrued. Speakers would tell of the global strategy with two concrete and specific goals: First, water for health – give communities access; and, second, water for food. Policies will support “climate smart” strategies for agriculture going forward. 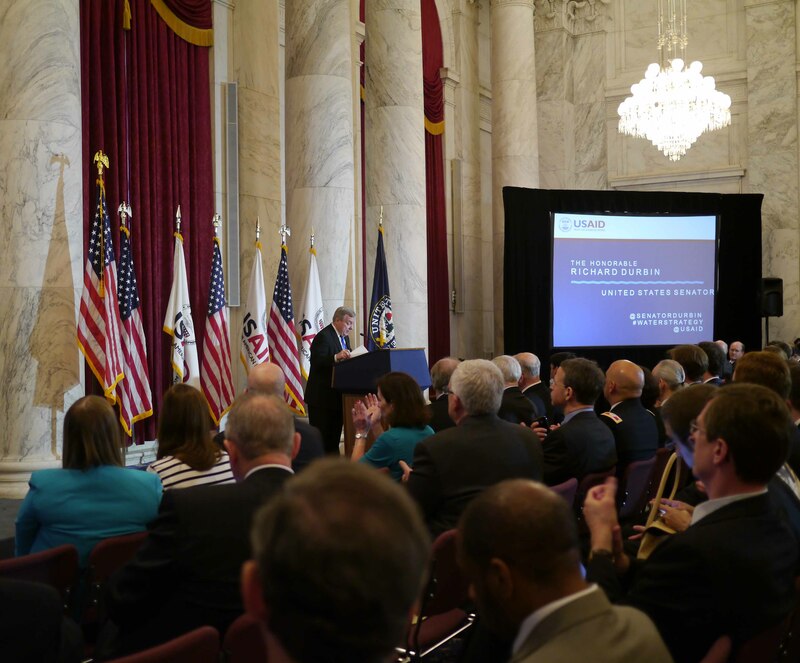 USAID will now be using “evidence based approaches” and measuring results. There are 2.5 million people living without sanitation. USAID was proud of the innovation of the Bill and Melinda Gates Foundation and thanked them for their partnership with “entrepreneurial projects” like the Foundation’s Toilet Challenge. Coca Cola was also praised for its “new way of working” with USAID. Women and the time they loose and dangers they face came up in three speeches. There were photos and stories of projects in Africa, India and Haiti but not one mentioned Central America. Another would tell us that the budget for USAID is less than 1% of the Federal Budget. And so, I began to wonder if any little NGO’s would participate in USAID’s Development and Innovations Program. And, when, I looked into what measures favored the Euphrates Valley over, say, Motagua it seems that the politics of the country and the attitude of the local leadership play a large part in determining which countries are favored. Perhaps, this explains why Guatemala has not been a USAID priority and, more importantly it predicts why that status is not likely to change. 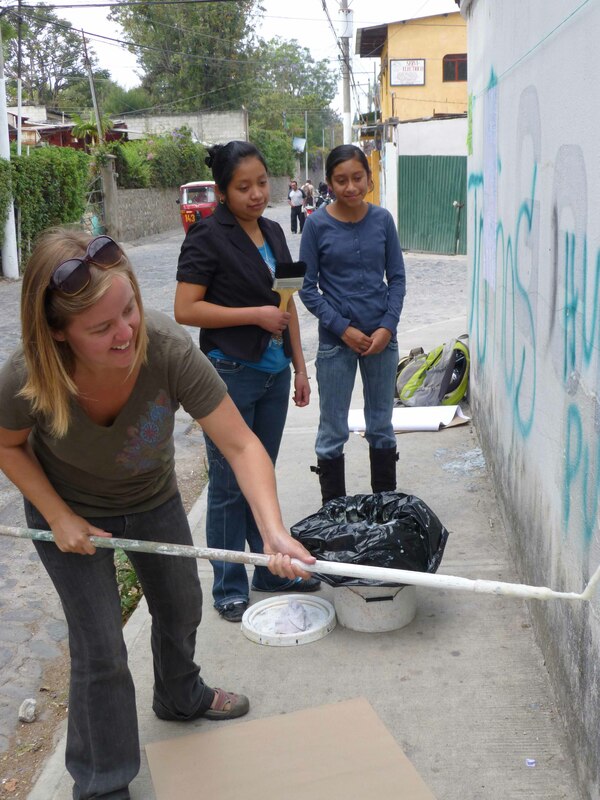 Students Mercy Rocisely Bocel Ajcalon and Keila Vanessa Cortez Coroton learn Street Art from Anna Miller. 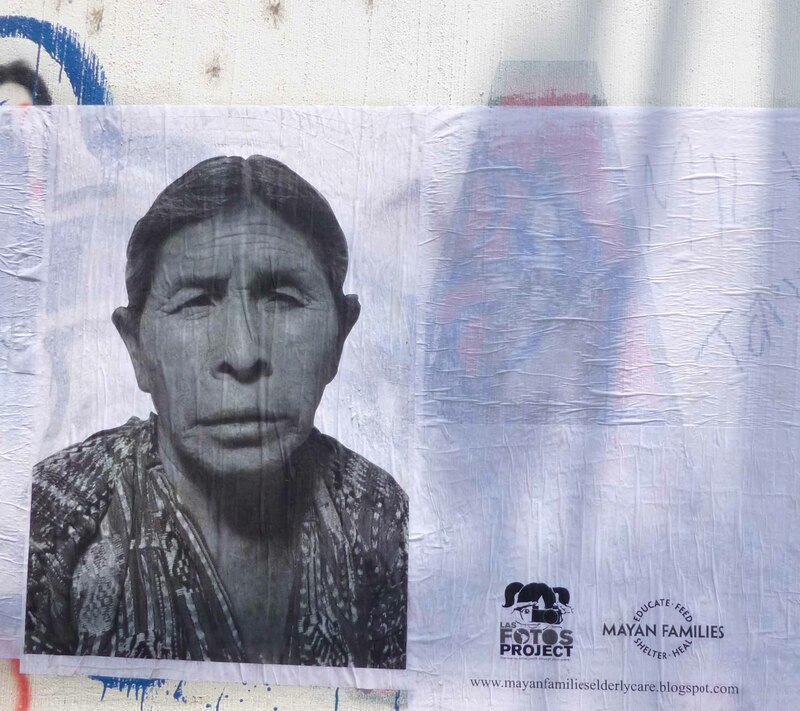 One quiet Sunday morning, Mayan Families mounted a photo exhibit — on a street corner. 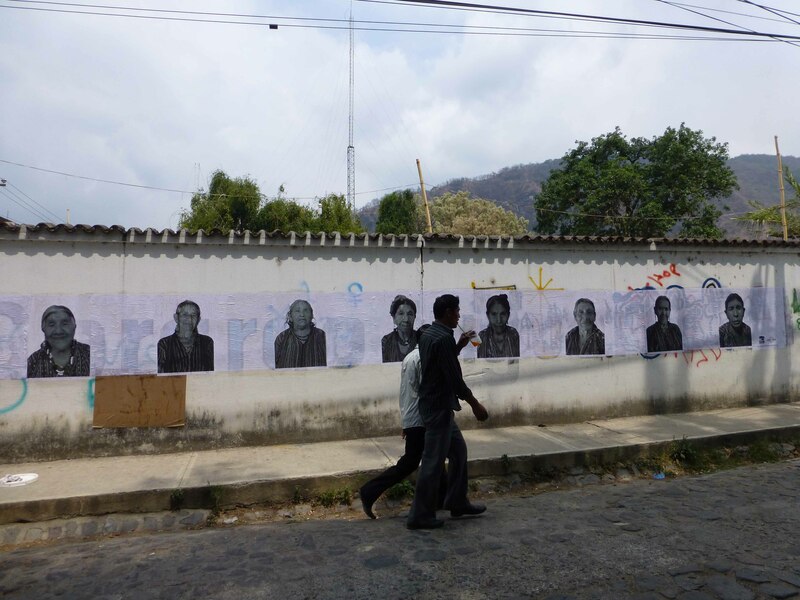 Large format black and white portraits of indigenous women were precisely pasted over a sun dappled wall, on a busy corner in Panajachel. Besides being beautiful, the block long installation covered splotches of random graffiti with elegance. And, the public space was made so attractive by the stately portraits that passers-by (even children) stopped to admire the work and watch as the sign pasting progressed. Elizabeth Hagee of Mayan Families explained that this was a six weeks long collaboration between Mayan Families and Anna Miller of Las Fotos Proyect Ms. Miller conducted a series of photo workshops for several women and this place would be the show’s official “opening.” The instructor carefully rolled wheat paste on to the wall and told her students to line up with the taut vertical string stretched between two tacks. As the students set about covering some of the most offensive marks on the wall, Ms. Miller told us that plotter paper was much cheaper than white paint. The whole group would end up elbow deep in the glue but the wall would look very neat; pages of blank paper were placed between the images as spacers. The project is as beautiful as it is integrative. The San Jorge photographers were invited to pose some of the local senior citizens that Mayan Families serves in their community. As a result, the subjects were honored and the photography class was rewarded with these epic exposures.